Egypt’s new ambassador to Israel started his activities as envoy by visiting the Coptic Orthodox Church in Jerusalem, nearly two weeks after its monks were assaulted by Israeli security forces after a protest over a disputed ancient monastery that historically belongs to Egypt. 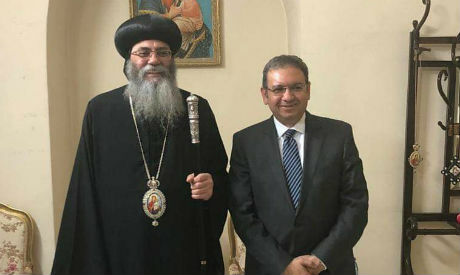 In an official statement, Egypt’s foreign ministry said the country’s ambassador to Tel Aviv, Khaled Azmi, kicked off his tenure with a visit to the Church, where he was received by Metropolitan Antonious of the Holy City of Jerusalem and the Far East. According to the statement, the visit came amid Azim’s keenness to preserve the Church’s belongings and its rights in the Holy City, including its historical right in Deir Al-Sultan Monastery (Sultan Monastery) in Jerusalem's Old City following the assault on the monks. Azmy was appointed in August but only arrived in Israel on Sunday to carry out his duties, succeeding Hazem Khairat, who served as ambassador to Israel for more than two years. In late October, Israeli security forces assaulted Egyptian Coptic monks and arrested at least one during a protest against the restoration of Deir Al-Sultan Monastery. The arrested monk was later released. The monks were protesting peacefully against restoration work planned by the Israeli government at the monastery without the consent of the Coptic Orthodox Church. Ownership of the 1,000-year-old monastery has been the source of a decades-long dispute. The monastery, where Ethiopians have lived for decades, had been owned by the Egyptian Coptic Orthodox Church since the 7th century, according to Antonious. Copts remained in control of the monastery until 1970 when Israeli authorities handed its control over to the Ethiopian Orthodox Church after police changed the monastery's locks and gave them the keys. Numerous Israeli court rulings ordering that the monastery be returned to the Copts have not been enforced.